Inspired by the classic Disney short Get a Horse comes the Disney Traditions Peg Leg Pete Get a Horse Black Hearted Bully Statue. Peg Leg Pete is beautifully crafted by Jim Shore with his signature combination of unique color palette and meticulous handcrafted attention to detail. 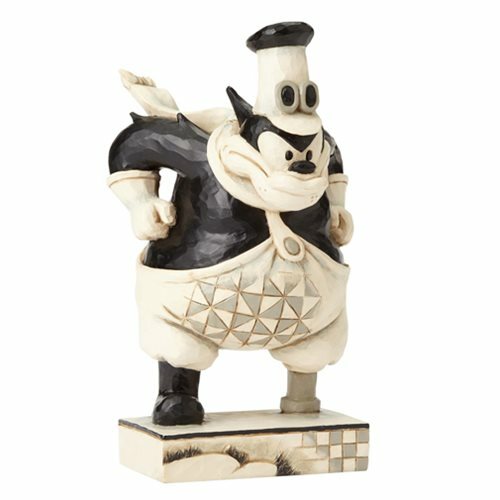 The Disney Traditions Peg Leg Pete Get a Horse Black Hearted Bully Statue is made of stone resin. Measures about 7 1/2-inches tall x 4 1/2-inches long x 4 1/2-inches wide. Ages 15 and up.